B, Sacrifice Urborg Panther: Destroy target creature blocking Urborg Panther. 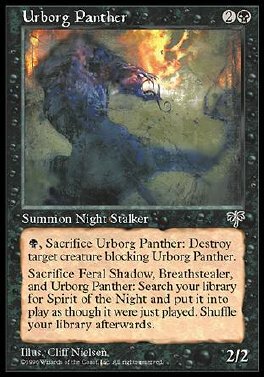 Sacrifice a creature named Feral Shadow, a creature named Breathstealer, and Urborg Panther: Search your library for a card named Spirit of the Night and put that card into play. Then shuffle your library.